The Philippines is again enlisting support from outside forces, the United States in particular, in its dispute with China over territory in the South China Sea. 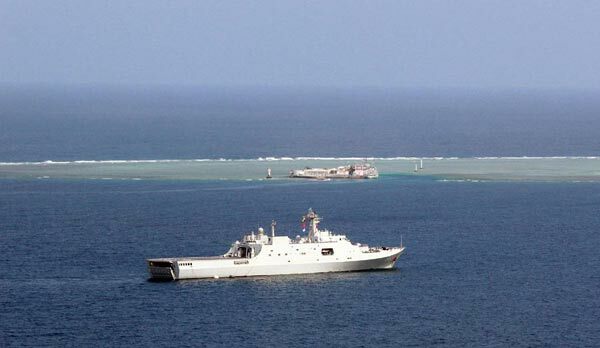 This time, it is attempting to form a "united front" to oppose China's reclamation and construction work on the Nansha Islands, turning a blind eye to the fact that the involvement of outside forces will only further complicate the situation and raise tensions in the waters. On Monday, Philippine Defense Minister Voltaire Gazmin said his country is seeking a "stronger commitment" from Washington in the light of China's construction activities. Gazmin will join Philippine President Benigno Aquino III on a three-day visit to Japan next week to discuss the transfer of Japanese military equipment to the Philippines. Judging by Manila's previous behavior, it will probably use the opportunity to play up its maritime dispute with China. It is crystal clear that Manila is using China's island building as an excuse to fish for illegitimate interests in the troubled waters. Beijing has reiterated on many occasions that its island construction work is designed to provide better services for vessels in the waters, whether those of China or other countries. Those with an impartial mind will recognize that the construction activities will actually help China shoulder its international responsibilities in the South China Sea, which include search and rescue missions, disaster prevention and mitigation, meteorological observation, ecological conservation, navigation safety and fishery services. By involving countries which have nothing to do with the maritime dispute, Manila is seeking to consolidate its unwarranted claims on China's territory and cover up its persistent trouble-making. And by throwing its weight behind Manila, the US, in pursuit of its own strategic considerations in the Asia-Pacific region, is only encouraging Manila in its mischief-making. In fact, Washington has too many times failed to honor its stated commitment to neutrality in the South China Sea disputes, as it has failed to criticize Manila for its illegal claims and tricks. Hearing US officials' recent hard-line rhetoric toward China and seeing the US military's provocative move in the waters last week, people cannot help wondering whether Pentagon is now moving to the forefront in challenging China in the South China Sea. Washington should know its meddling in the South China Sea has been destabilizing the region. It should stop stoking regional tensions and help cool down Manila by warning it against military buildup, thus honoring its commitment to peace.